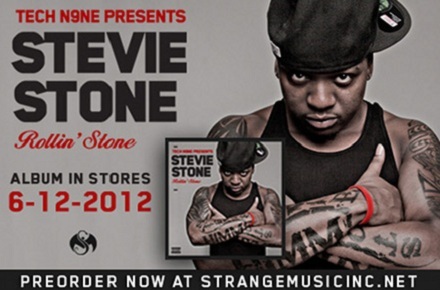 With just a week to go until the release of Rollin’ Stone, Stevie Stone gives fans another taste of his Strange Music debut with the thunderous, “Raw Talk”. In this exclusive clip, Stevie Stone drops a preview of the track that is also set to feature Funk Volume’s Hopsin and SwizZz. Much like the other early cuts from Rollin’ Stone, “Raw Talk” is whole different kind of monster for Strange Music fans and promises to be another hit from Stevie Stone. Grab a helmet and get your dome smashed to Stevie Stone’s “Raw Talk”. What did you think of the preview? Are you excited to hear Hopsin and SwizZz?